Connecticut Gov. Dan Malloy speaks before introducing President Obama during a rally at Central High School on Sunday in Bridgeport, Connecticut. With the election just a day away, FiveThirtyEight is projecting Democrats and independents to gain a net of three governorships. But an unusual number of races are quite competitive; in nine states, the trailing candidate has at least a 20 percent chance of winning, according to the FiveThirtyEight forecasts. Five races are 61-39 or closer — compared to just one such race in our Senate forecast. Let’s look at some of the closer races. We’ll go by region, from north to south and from east to west. The forecasts are based on polls through Sunday night; we’ll capture any polls released Monday in an update Tuesday. The Maine race revolves around two-and-a-half candidates. Independent Eliot Cutler, who has been lagging in the polls, told his supporters they could back another candidate if they choose. He stopped airing some of his ads, and one of Cutler’s big supporters, independent Sen. Angus King, is now backing Democrat Mike Michaud. You might think Cutler’s decision would sink Republican Gov. Paul LePage’s re-election. LePage snuck by four years ago when liberals split their vote between Cutler and Democrat Libby Mitchell. The result has been something of a mismatch: a conservative Republican in blue Maine. The state has elected Republicans before — for years both its senators were Republicans, and one still is — but typically it elects moderates. LePage is much more conservative than Maine’s Republican Sen. Susan Collins, for instance, according to OnTheIssues.org. And LePage has been more unpopular than popular for most of his term. But Cutler hasn’t dropped out of the race, and not all of his votes will go to Michaud. FiveThirtyEight is estimating that he’ll get half as many votes as he would had he not semi-dropped out. With LePage winning a greater share of Republicans than Michaud is Democrats, Michaud is only a 57 percent favorite. In Massachusetts, Republican Charlie Baker has an 86 percent chance to defeat Democrat Martha Coakley. Yes, this is the same Coakley who lost to Scott Brown in the special Senate election in 2010. Whether Coakley blew this race is an open question. Her favorable rating — 42 percent favorable vs. 47 percent unfavorable, according to the most recent Western New England University (WNEU) poll — didn’t help. What cannot be debated is that Massachusetts has a history of electing relatively moderate Republicans as a check on its liberal legislature. Before Democratic Gov. Deval Patrick was elected in 2006, there hadn’t been a Democrat elected governor of Massachusetts since Michael Dukakis in 1986. Baker has run a fairly good campaign. He has spent a ton of money on television and is well liked by Massachusetts’s voters. In the WNEU survey, Baker’s favorable rating was 52 percent compared to an unfavorable rating of just 27 percent. That’s great for any politician in any state these days. Next up: Rhode Island, where the picture is a lot less clear. FiveThirtyEight has Democrat Gina Raimondo as a 75 percent favorite because she has led Republican Allan Fung in every poll taken of the race, but there have been very few public polls conducted compared to other competitive races. The last live telephone poll by Brown University had Raimondo ahead 38 percent to 37.4 percent for Fung, with independent Bob Healey at 11.8 percent. While it would be easy to assume the Democrat can’t lose in Rhode Island given Democrats’ dominance of the state in presidential elections, it’s important to realize how unique Rhode Island’s politics are. It is the least polarized state in the union with plenty of liberal Republicans (think Lincoln Chafee) and conservative Democrats. No Democrat has been elected governor since 1992. Raimondo is seen as a moderate. She has failed to pull together the Democratic base after a hard-fought primary. She is winning 26 percentage points less of the Democratic base than Fung is winning of the Republican base. Raimondo has also been outspent in the general election. Raimondo is the favorite, but it’s easy seeing either of these candidates winning. Wrapping up our tour of New England, the Connecticut gubernatorial race is perhaps the closest in the country. 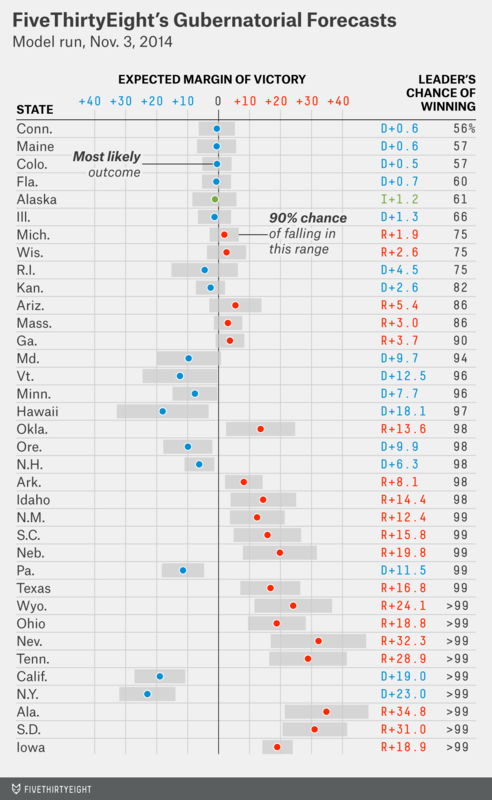 FiveThirtyEight has Democratic Gov. Dan Malloy with a 56 percent chance of holding off Republican Tom Foley. It’s nearly a coin flip. In a rematch of the same race four years ago, Foley and Malloy have traded polling leads all campaign. Malloy won in 2010 by just 0.5 percentage points, nearly identical to his 0.6 percentage-point lead right now. Before Malloy, Connecticut, like Massachusetts, hadn’t elected a Democrat governor since 1986. The reason Malloy is in trouble is simple: the economy. Per Gallup, Connecticut residents rank far below the national average in confidence in the economy — they’re less likely than to think that it’s a good time to get a job and that taxes are at the proper level, and less likely to be satisfied with the state or city they live in. According to a Quinnipiac University poll taken in September, Foley had a double-digit lead on Malloy on the question of who was best to handle jobs and the economy, government spending and taxes. Will the state’s Democratic lean be enough to drag Malloy across the finish line? We can’t be sure. Foley’s favorable ratings have not been great, but they are much better than Malloy’s. The incumbent has consistently had a higher unfavorable rating than favorable rating. I’ve written about Florida twice before. The story has been the same throughout campaign season. Voters dislike both candidates — former Republican governor turned Democrat Charlie Crist and current Republican Gov. Rick Scott. Both candidates’ net favorable ratings (favorable rating minus unfavorable rating) have been negative for most of their campaigns. The race may be remembered more for the fact that it features the two most disliked gubernatorial candidates over the past decade than for any particular policy or issue. Quinnipiac has found that voters think neither candidate is trustworthy and that they say Scott doesn’t care about people like them. Scott was able to close an early deficit in the polls by vastly outspending Crist; more than $100 million total has been spent on the race so far. Yet the recent gap in spending between the two sides hasn’t been nearly as pronounced as it was earlier. Florida voters have to choose one of these guys. FiveThirtyEight thinks Crist is slightly more likely to be that guy; he has a 60 percent chance of winning. Earlier this year, there was an anti-incumbent mood in the Midwest. Three governors — Republican Rick Snyder of Michigan, Republican Scott Walker of Wisconsin and Democrat Pat Quinn of Illinois — looked like they might lose earlier in the cycle. Now, all three are favorites. In Michigan, Snyder was elected four years ago as one tough nerd, someone who would provide an economic stimulus to a state that badly needed it. But voters aren’t convinced the economy has improved. According to Gallup, Michigan residents are far less likely to have confidence in their state’s economy than the average voter nationwide. Democratic challenger Mark Schauer has tried to leverage that angst to his advantage. He has pointed out that the governor’s policies have not resulted in rising job growth. Snyder contends that the Michigan has grown jobs, if slowly, under his administration and that lowering taxes helped to keep the economy afloat in a state that was hard hit by the 2008 recession. Voters seem more likely than not to give Snyder a second term. According to EPIC-MRA, most voters think the state is headed in the right direction and have a more favorable view of Snyder than Schauer. The race should be close; FiveThirtyEight projects Snyder to win by less than 2 percentage points. That is good enough to be a 75 percent favorite. Gov. Scott Walker faces his third election in Wisconsin in the past four years. He’s loved by Republicans and hated by Democrats. There was some belief that an investigation of the Walker campaign’s possibly illegal coordination with outside groups might damage the incumbent’s prospects, but it doesn’t appear to have moved opinion much. Walker is viewed the same way by Wisconsinites as he has always been. According to the Marquette Law School Poll, which has used a likely voter sample all year, Walker hasn’t ever had an approval rating above 51 percent or below 47 percent among registered voters. Not surprisingly, his polling numbers against Democrat Mary Burke have been more consistent than sappy moments on “Full House.” He has led by an average of 3.7 percentage points over Burke among likely voters in polling taken this year by Marquette. FiveThirtyEight projects Walker to win by 2.6 percentage points. Burke will need the polls to be wrong to win. Marquette’s most recent survey found that a majority of voters thought the state was headed in the right direction and that Walker was up 7 percentage points among likely voters. That may be overstating Walker’s lead, though it’s doubtful the poll is off by enough for Burke to win. Walker is a 75 percent favorite. Quinn, of Illinois, looked to be in the most danger of these three incumbents. My polling-based analysis in early summer had him with a 25 percent chance to beat Republican Bruce Rauner. At the time, however, I warned that Quinn probably had a better shot than early polls suggested. Quinn is a Democratic governor in a Democratic state. He won in 2010 despite an approval rating of 40 percent (at best) and with only about 15 percent of voters saying the state was heading in the right direction. This year, Quinn’s approval rating is again between 35 percent and 40 percent. And again, he looks like he may win. His campaign has somewhat successfully painted Rauner as an out-of-touch millionaire. According to a recent Chicago Tribune poll, voters are more likely to say Quinn is in touch with people like them. They also view him as more honest than Rauner, even if they think Rauner can better handle the economy. The fight between an incumbent people don’t approve of and a challenger with his own flaws has resulted in a close race, but one in which Quinn is a favorite. The FiveThirtyEight model gives him a 66 percent chance of winning. There’s really only one competitive gubernatorial race on the Great Plains: Kansas. Republican Gov. Sam Brownback is in trouble for three related reasons: a Republican party split, economic woes and education. For as long as most of us have been alive, Kansas has leaned to the right, practicing its own brand of moderate Republicanism. Brownback, though, has governed as a pure conservative. It has hurt him; Democrat Paul Davis has been endorsed by scores of moderate Republicans upset by cuts to education necessitated by Brownback’s large tax cuts. According to SurveyUSA, taxes and education remain among the most important issues to voters in 2014. The result has been disenchanted Republicans. The share of registered Republicans in Kansas was 9 percentage points higher than the share of self-identified Republicans, according the latest Marist College poll. Many of these Republicans now identify as independent, a group Davis is winning by a 26-point margin. Although polls have narrowed from a few months ago, most surveys have Davis riding Republican discontent to a lead. He’s an 82 percent favorite. The issues facing Democratic Gov. John Hickenlooper in Colorado are considerably different. Voters are not upset with the economy; they’re upset about social issues. After the 2012 mass shooting in Aurora, Hickenlooper, along with a Democratic legislature, enacted tough gun-control laws. Voters didn’t like that. They turned out two Democratic state senators in a recall in 2013, and voters still disapprove of Hickenlooper’s handling of gun control, according to Quinnipiac. Likewise, Coloradans are upset with Hickenlooper over his stance on the death penalty. Voters in the state are overwhelmingly in favor of the death penalty, but Hickenlooper turned against it while in office. Hickenlooper’s Republican challenger, Bob Beauprez, and his allies have emphasized Hickenlooper’s changed position in television ads. Yet even in his worst polls, Hickenlooper is liked by as many voters as dislike him. Polls have shown that he is running a few percentage points ahead of Democratic Sen. Mark Udall. That could make the difference in a tight race. Although FiveThirtyEight’s model forecasts Udall losing, it has Hickenlooper ahead by 0.5 percentage points and winning 57 percent of the time. Alaska is perhaps the strangest race of the cycle. As I discussed previously, Republican Gov. Sean Parnell is being challenged by a unity ticket of former Republican turned independent Bill Walker and former 2014 Democratic gubernatorial nominee Byron Mallott. In other words, there is no Democratic nominee for governor. To make matters even stranger, former governor and vice presidential nominee Sarah Palin has endorsed Walker and not her former running mate, Parnell. Why? It has a lot to do with taxes and energy prices. Oil prices continue to fall at a rapid pace, which is a big deal in Alaska. This lead to statewide deficits. Those have been made worse, Walker would argue, by the tax cuts on oil companies drilling in Alaska, which Parnell signed into law. This reversed the taxes Palin had signed into law when she was governor. Walker has argued that the state must cut spending even more than it has under the Parnell administration to erase the deficits. Parnell has argued that Walker and his team will cut education funding. This back and forth has left Walker with a slight advantage. FiveThirtyEight gives him a 61 percent chance of winning. Given the much-discussed lack of accurate polling in Alaska and the long time to count ballots, the winner of this race may not be known for days or weeks to come. There are a lot of tight races. Five seats are forecasted to flip from Republican to Democratic or independent control: Alaska, Florida, Kansas, Maine and Pennsylvania. Two seats are projected to flip from Democratic to Republican control: Arkansas and Massachusetts. If all the FiveThirtyEight favorites win, Republicans will have 26 governorships in 2015, Democrats will have 23 and independents will have one. CORRECTION (Nov. 3, 1:10 p.m.): A previous version of this article incorrectly said no Democrat had been elected governor of Rhode Island since 1990. A Democrat was elected in 1992.